* Fiscal Year 2018 (10/1/2017 - 09/30/2018) is currently under audit. This data is projected to be updated no later than April 2019. Unaudited financial reports can be found here. 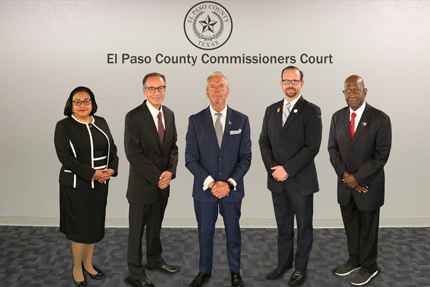 El Paso County is committed to providing transparency on financial information to the public through the publication of the County’s Annual Financial Report along with interim monthly financial reports, quarterly investment, revenue and expenditure reports and long-term debt reports on the County webpage. By doing so, it affords the public the opportunity to view and question how their taxpayer dollars are being spent. The County of El Paso has received the “Certificate of Achievement for Excellence in Financial Reporting” every year since 1989, from the Government Finance Officers Association. This recognition demonstrates that the preparation of the County’s Comprehensive Annual Report (CAFR) is prepared in accordance to generally accepted accounting principles (GAAP) and standards set forth by the Governmental Accounting Standards Board (GASB). Increase in property tax rate for FY2014 was partly due to an increase on the I & S (interest and sinking) portion of the tax rate because of the issuance of the $98 million certificates of obligation bonds in late 2012. 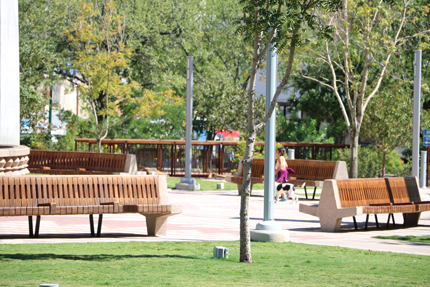 Overlapping rates are those that apply to property owners within the County of El Paso. Not all overlapping rates apply to all County property owners. 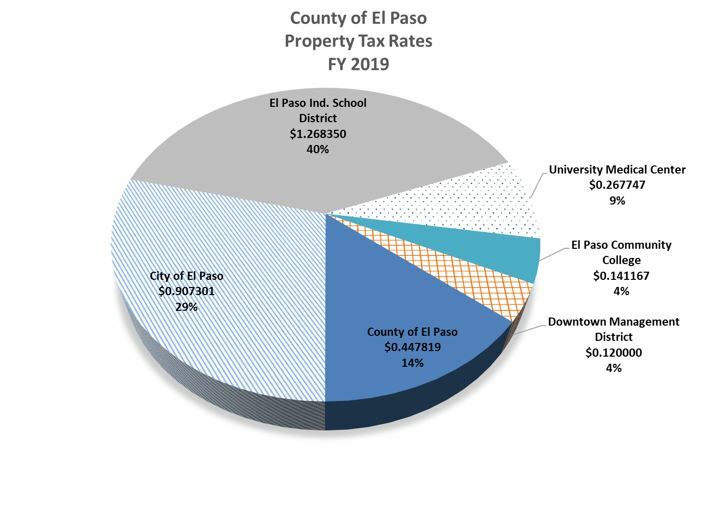 There are 27 local taxing authorities in the County of El Paso. 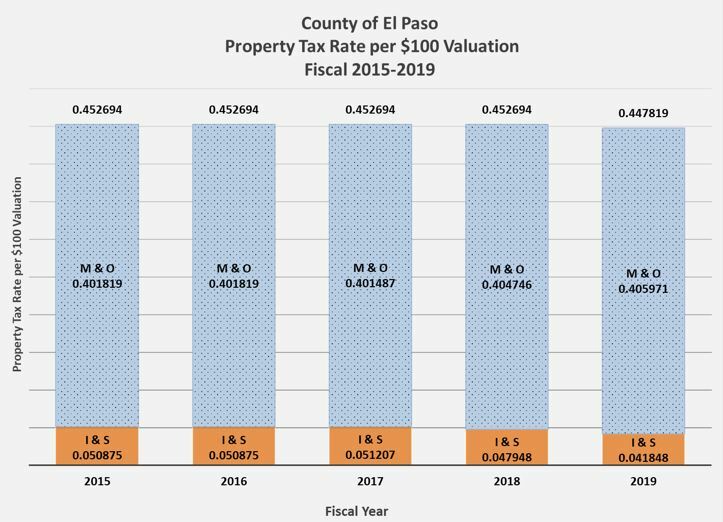 The six entities in the above graph represent the taxing authorities that fall within the County seat located in downtown El Paso. Per capita figures are based on an estimated population of 904,586 from the Texas Department of Health and Human Services, 2017. 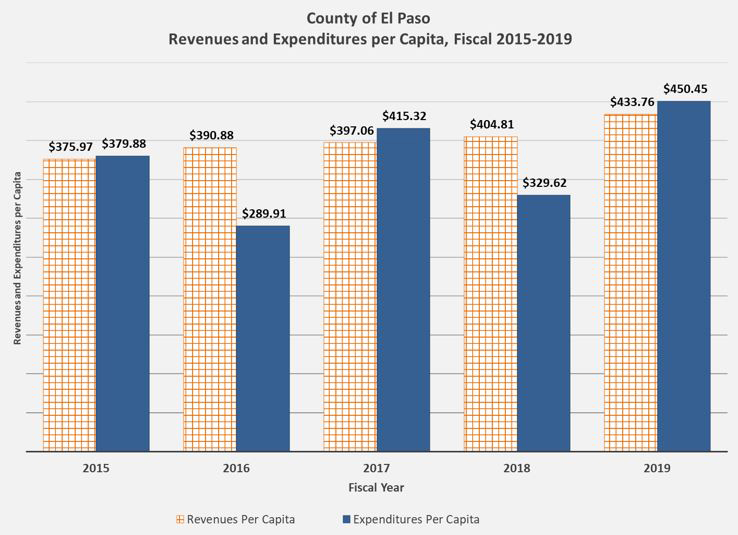 Revenue and expenditure amounts are from the County of El Paso Comprehensive Annual Financial Report for the fiscal year ended September 30, 2017.